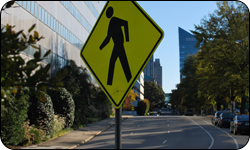 Unintentional pedestrian injuries are the 2nd leading cause of death in the United States for children ages 5 to 14? In 2010, 4,280 pedestrians were killed in traffic crashes in the United States and another 70,000 pedestrians were injured? Nearly 1 in 4 traffic deaths among children ages 14 and under are pedestrian deaths? Increase your visibility at night by carrying a flashlight when walking and wearing retro-reflective clothing. Always walk on sidewalks or paths. Cross the streets at street corners and always follow traffic signals and crosswalks. Be alert at all times; do not be distracted by cell phones or other digital devices. It is important to be aware of what is going on around you. Be attentive for cars that are backing out of or pulling into driveways or parking lots. Do not use drugs or alcohol when walking; they limit your ability to judge. Make eye contact with drivers to ensure that they see you. Do not assume they are paying attention and will stop for you.